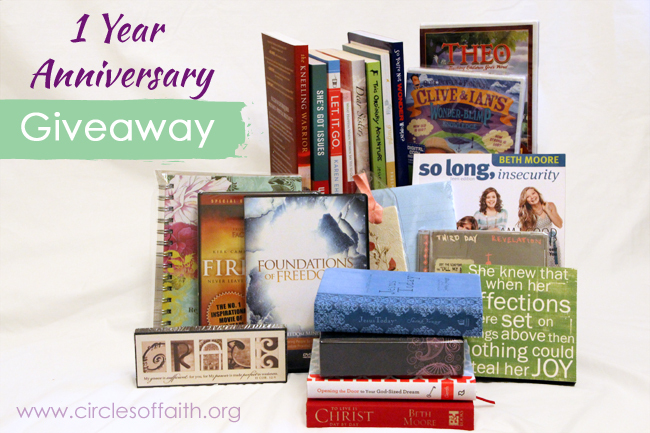 So here we are…one year after our launch of Circles of Faith, Where Faith, Life, and Community Intersect. We think that’s cause for a celebration. Don’t you? Over the past year, we’ve had over 150 posts by fabulous, passionate writers from all over the globe on a variety of topics such as missions, marriage, relationship, parenting, God-stories, music, and books. We’ve made it our mission to share with you stories and articles of excellence from both known names in global ministries and voices you may never have heard of; each with something important to say. Faith—Stories, Testimonies, God Moments to INSPIRE You shared on Mondays. Life—New Ideas, How-Tos, and DIYs to EQUIP You shared on Wednesdays. Community—Books, Music, Ministries, Interviews, Events to CONNECT You posted on Friday. 1. Our Contributors—We are so excited to have a growing roster of women who contribute their voice, insight, and wisdom every month. Check them out! 2. Calendar—Thanks to Joy Kay our Director of Communications, we now have a Calendar of Events that covers bibles studies, conferences, music, and more in the greater New York area. We want to expand our reach. So please contact Joy Kay at joykay08@yahoo.com with your event information. 3. An Active Social Media Presence—Our Facebook page has lots of information, pictures, quotes, etc., that you won’t see on our site. We’d love connect with you through Twitter. And we’re pinning more on Pinterest too. Join us! 4. A Facebook Prayer Group—We believe in the power of coming together in prayer, so we now have an online prayer group. Come pray with us and let us pray for you! 5. The First Friday Book Faves—Starting November 1, our contributors will share the books on our nightstands. We look forward to you linking up or sharing in the comments your book faves too. There is lots more to come as we seek the Lord for ways to best support you in your faith walk. Any ideas? We’d love to hear… and don't forget to share us with your friends through emails, facebook, twitter. Also, we'd love to here your story! If you would like to submit a post to COF check out our guidelines. In celebration of out 1st Anniversary we have teamed up with our contributors and guest posters to bring you a fabulous giveway. There are many ways to enter. The more you enter, the greater your chances of winning. So here are the goodies…and you can win them all.